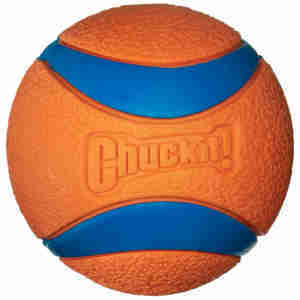 The Chuckit Ultra Ball is a durable, super bouncy rubber dog toy that is great for long range fetch games. The premium quality ball is compatible with the Chuckit Launchers. (small ball with small launcher, medium with medium launcher, large with large launcher) and it floats on water. Large balls measure 7.3cm, medium balls measure 6.5cm, small balls measure 4.8cm. Chuckit, Balls for life if you don't lose them. The Chuckit balls are regarded by most dog owners as the only really durable ball. Other brands give way sooner or later and the dogs seem to appreciate the Chuckit difference as well.